Sprouted Mungo - Eclipse Organics - One of the Greatest Vegan Meals Ever! Once in a while, you find a recipe that makes you see food in a different way. We are all looking for great tasting, simple and healthy food. Sprouted Mungo is so simple, sensational tasting and awesomely healthy. At least once a week or twice, I do not eat meat. Mungo has a richness and wholesomeness that makes vegan food totally enjoyable to anyone. This is a very simple collection of ingredients. Many of us are so busy and tend to be rushing all the time. One good tip, slow down and get all your ingredients together before you start making Sprouted Mungo. Weight thing out and prepare the foods in advance. The original version of this recipe only calls for the mung beans to be soaked overnight. 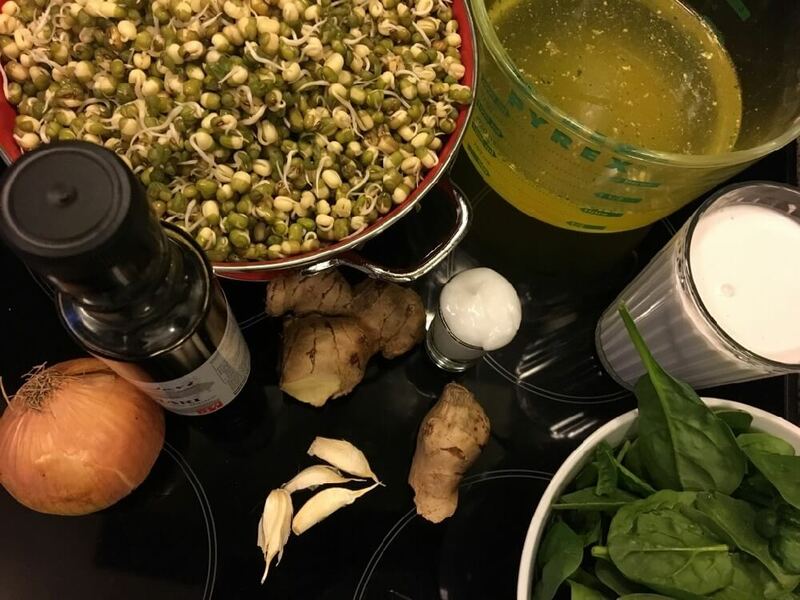 To add nutrition and flavour, you should at least activate or sprouted the mung beans before adding them to the recipe. Sprouting for Sprouted Mungo is simple. There are not tricks and loads of reasons to do it. For all our tips to sprouting visit our Sprouting Made Simple page. Activating and sprouting adds loads of extra nutrition and gets rid of most of the phytic acid that can cause bloating or gas in some people when they eat legumes. The extra step to sprout adds a great vegetable freshness to this meal. 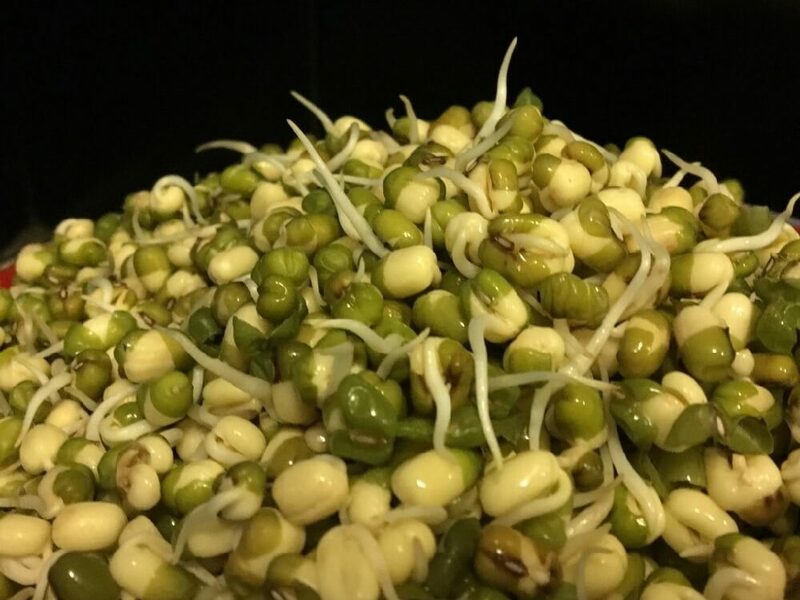 Sprout the mung beans: Soak overnight (see Tips & Tricks). Drain, rinse well then leave on your sink in the colander. Repeat rinse every 12 hours until your sprouts have a tail that is twice the length of the beans body. Heat the coconut oil and add roughly chopped onion, garlic, and ginger. Saute for a few minutes until the onion is transparent. Do not allow onion to brown. Add mung beans, coconut milk and vegetable stock. 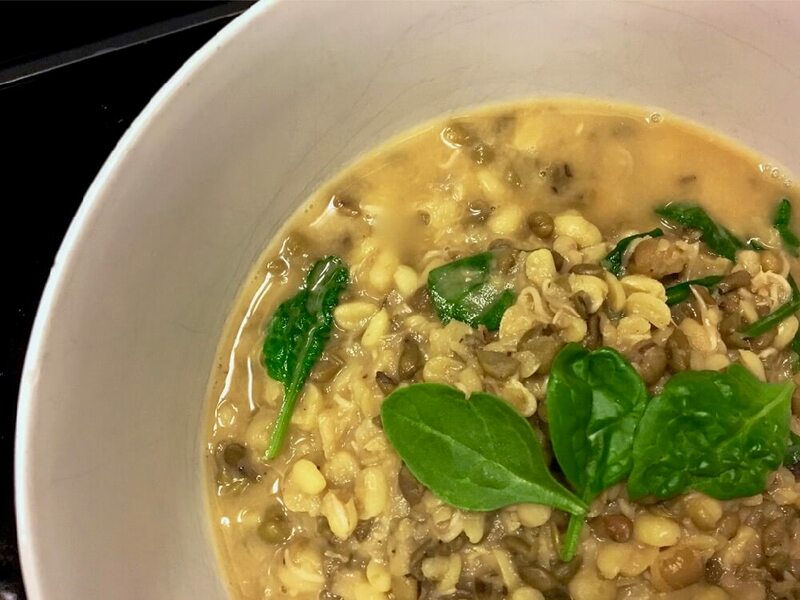 Bring to a simmer for about 45 minutes, until the mung beans are tender to bite. Add the tamari and pepper to taste. Once the beans are simmering and the texture is as you would like, add the chopped coriander and stir through. Remove from the heat. Add the spinach. If you are not going to eat all the Mungo right away, only add the coriander leaf and spinach to the portion you will use. Add the fresh greens before you serve on another day.